World AIDS Day is commemorated each year on the 1st of December and is an opportunity for every community to unite in the fight against HIV, show support for people living with HIV and remember those who have died. The UNAIDS World AIDS Day theme for 2011 to 2015 is: “Getting to Zero”. This year, South Africa will focus on ZERO DISCRIMINATION, without losing sight of the other ‘zeroes’: zero new HIV infections and zero AIDS related deaths. We call on all South Africans to join our Zero Stigma, Zero Discrimination campaign for World AIDS Day 2014. The aim of this campaign is to ensure that the rights of people living with HIV and AIDS are not violated, and that discrimination on the basis of HIV, AIDS and TB is reduced, and ultimately eliminated. Deputy President Cyril Ramaphosa, as chair of South African National AIDS Council (SANAC) will mark World AIDS Day on 1 December 2014 in Virginia, Lejweleputswa, in the Free State under the theme “Zero Stigma and Discrimination”. This annual event allows people around the world to unite in the fight against HIV and AIDS, show their support for people living with HIV and to commemorate people who have died. This year’s World AIDS Day is taking place against the backdrop of South Africa hosting the 21st International AIDS Conference in Durban in July 2016. This will be the second time that Durban will host this conference, having hosted the event in 2000. South Africa has been relentless in its mission to turn the HIV, AIDS, and TB epidemics around and there are notable achievements to celebrate. A review of our efforts in addressing the HIV and AIDS epidemic over the past 20 years, paints a mixed picture. There have been many scientific advances in HIV treatment and we now have a much better understanding of the virus More people are receiving antiretroviral treatment, which means HIV infection rates are decreasing. There is also a scientific optimism around the benefits of treatment as prevention, and progress towards a cure and vaccine. However, despite these advances, stigma and discrimination still persist for many people living with, or affected by HIV. World AIDS Day 2014 is an opportunity for all South Africans to remind themselves that HIV is still a reality and that it is incumbent on all of us to continue fighting prejudice, stigma and discrimination. South Africa has come a long way in the fight against HIV and AIDS. In 2012 government implemented the National Strategic Plan on HIV, Sexually Transmitted Infections and Tuberculosis 2012 – 2016. In 2010 government also scaled up its antiretroviral treatment programme. A further expansion is planned from January 2015 to bring South Africa in line with World Health Organisation treatment guidelines. As part of this, the Department of Health will start HIV-positive patients with a CD4 count of 500 or less on antiretroviral treatment, as opposed to the present CD4 count of 350. All HIV-positive pregnant women will also receive lifelong treatment, regardless of their CD4 counts. Currently, HIV-positive pregnant women receive treatment until they stop breastfeeding. Despite our many advances we still struggle to eliminate the stigma associated with HIV infection and the resultant discrimination. There are still people with limited knowledge of the facts about how to protect themselves and others. The devastating effects include abandonment by spouse or family, social ostracism, job and property loss, school expulsion, denial of medical services, lack of care and support, and violence. It also results in a lower uptake of HIV preventive services and postponing or rejecting care. Women tend to experience greater stigma and discrimination than men and are more likely to experience its harshest and most damaging effects. World AIDS Day is important as it reminds the public that HIV has not gone away and that collectively, there is the need to increase awareness, fight prejudice and improve education to maintain and achieve the aims and objectives of the country as set out in the National Strategic Plan on HIV, STIs and TB 2012-2016. Stigma and discrimination can be as devastating as the illness itself and may mean abandonment by a partner or family, social exclusion, job and property loss, school expulsion, denial of medical services, lack of care and support, and violence for those affected by them. These consequences, or fear of them, mean that people are less likely to come in for HIV testing, disclose their HIV status to others, adopt HIV preventive behaviour or access treatment, care and support. Every sexually active South African is at risk of contracting HIV. We call on all South Africans to recognise that HIV and AIDS are chronic diseases, and that people living with HIV can have full and happy lives. We each have a responsibility to treat those who are struggling with an HIV-positive diagnosis with compassion, those struggling with AIDS with care, and ourselves and our sexual partners with respect. Addressing stigma and discrimination is important in mitigating the impact of HIV. 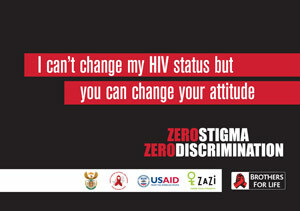 You can download full-size banner and poster in PDF from the South African National AIDS Council (SANAC) website.